I hope to offer 2-3 articles about the book of which this is the first. This is not a traditional book review, but I offer some observations about parts of the book I found interesting. 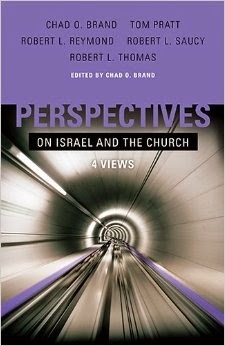 To be upfront, I am not a neutral observer on this topic of Israel and the church. I have written on this topic and would identify with the positions of Thomas and Saucy, although I might word or emphasize some things differently at times. On a lighter side, three of the four presenters' names start with "Robert L." There must be something about "Robert L.'s" that are drawn to Israel/Church issues. On a more serious note, two of the contributors are with the Lord now. Robert Reymond died in September 2013. And Robert Saucy passed away very recently on March 12, 2015. We should be very grateful for the many helpful contributions of these two men of God. It is sobering knowing that this book includes some of their latest writings before they passed away. I start with some thoughts on Robert Reymond's presentation of the "Traditional Covenant View." My comments relate mostly to Reymond's comments about Dispensationalism which cover much of his chapter. Note that the page numbers I provide below are based on the electronic Kindle version which allegedly parallels the pages in the hard copy edition. First, Reymond spends much time comparing the systems of Covenant Theology and Dispensationalism. These are the starting point through which he addresses the Israel-Church issue. Not surprisingly, Reymond sees Covenant Theology as far superior to that of Dispensationalism. The attention given to Dispensationalism makes his treatment as much or more a refutation of Dispensationalism than a presentation of the covenantal view, although there is material on the latter as well. One senses that Dispensationalism is much on his mind and is in need of serious rebuttal. He sometimes uses strong language such as "radical conclusions that dispensationalists draw" (31). Second, Reymond critiques Dispensationalism through two lenses—(1) the Dallas Theological Seminary doctrinal statement, and (2) pastor and author, John Hagee. Interestingly, he says "all of them [dispensationalists] would agree with the Dallas Theological Seminary (DTS) Doctrinal Statement" (p. 22). Concerning Hagee he says, "Hagee has thrown down the dispensational gauntlet and it is high time that covenant theologians picked it up and responded to him biblically" (36). One subtitle is called, "The Abrahamic Covenant as the Antidote to Hagee's Primary Error of Dispensationalism." As a dispensationalist, I found his linking of Dispensationalism with the DTS doctrinal statement and John Hagee a little odd. Many dispensationalists do not view the DTS statement as the guiding document for their beliefs. And John Hagee, although popular in some circles, is certainly not a main representative of academic Dispensationalism. Once Reymond introduced Hagee as the primary representative of Dispensationalism it hurt the credibility of his critique of Dispensationalism. Hagee does have some influence at a popular level, but there are credible dispensational scholars that Reymond could have chosen. This would have made his critique more credible. Since this "views" book is an academic book, it is disappointing that a more scholarly form of Dispensationalism was not addressed in his chapter. I think Klooster and Hoekema have a better approach on this issue. Fourth, Reymond openly embraces the title "replacement theology" using it at least three times. This is important because some have claimed that Covenant Theology is about "fulfillment theology," not "replacement theology." But Reymond shows that the old title of "replacement theology" is still part of Covenant Theology. While it would not be fair to say that all covenantalists use this language, evidently some still do. On two occasions Reymond refers to "our Lord's 'replacement theology'" (48), but Jesus speaks of the apostles ruling over the twelve tribes of Israel at the time of the renewal of the earth (Matt 19:28). Our Lord also stated that the trampling of the city of Jerusalem is only for a time (Luke 21:24), implying a reversal of Jerusalem's fortunes for the better. This is the opposite of replacement theology. Fifth, like most covenantalists Reymond uses the concept of the covenant of grace to argue against the idea of a future restoration of the nation Israel. The idea seems to be that if God's plans since Genesis 3 always involve salvation by grace then this rules out the idea of any special significance for Israel. This approach though makes the mistake of thinking that being unified in salvation by grace means there can be no distinctions or diversity in the people of God or that all ethnic distinctions are erased. But there are several examples in the Bible where unity and diversity work together. The members of the Trinity are equal in essence but they possess distinct functional roles. Members of a family are equal in essence but the roles of fathers, mothers, and children are different. Men and women are equal in Christ (Gal. 3:28) but have functional distinctions in the church (see 1 Tim. 2). I see no reason why when Jesus rules the nations at His return that Israel could not have a functional role of leadership and service to the nations at this time (see Isa 2:2-4; 19:16-17, 24-25). Sixth, Reymond operates off the assumption that Dispensationalism still teaches different destinies for Israel and the church: "...two distinct destinies, namely, the glorified land of Israel for the former [Israel] and a glorified heaven for the latter [church]" (17). There is no doubt that this earthly vs. heavenly destiny distinction was held by some dispensationalists in the 1800s and into the twentieth century. But this view is largely rejected by dispensationalists today. A strong majority hold that the millennial earth and the new earth of Revelation 21-22 will include Israel and the church. So he appears to be addressing an older view that is mostly rejected today. "I admit that it is virtually certain that the apostles, speaking as they did of the kingdom being 'restored to Israel,' were probably thinking of the kingdom as a national entity with its government centered in Jerusalem and its domain encompassing the land of their fathers." "But, theirs was both a misapprehension of the nature of the kingdom Jesus had in mind and a mixture of truth and errors as the immediate context shows" (58). This puts Reymond in the difficult position of claiming that the apostles were in error concerning the nature of the kingdom after forty days of kingdom instruction from the risen Jesus. I think it's better to go with the apostle's expectation of a future restoration of the kingdom to Israel over Reymond's view that they had a "misapprehension." The apostles wanted to know the timing of the kingdom, but their understanding of its nature was not in question. Eighth, I would like to end with one point of agreement. Reymond makes much of DTS denying that OT saints had significant knowledge of the Messiah. Personally, I don't think there is one view in the dispensational camp of how much the OT saints knew about the messiah, but I agree with Reymond that Old Testament saints had more knowledge of the coming Messiah than what DTS has traditionally taught. There was a specific messianic hope from Genesis 3 onward. I believe Eve thought Cain might be the deliverer (Gen. 4:1) and that Noah's father believed Noah might be the one to reverse the curse (Gen. 5:28-29). So there was a messianic hope in the OT. This does not mean that OT saints and Jesus' early followers always connected the dots as they should before the cross, but there is information about the Messiah that OT saints could grasp. It was profitable to read Reymond's chapter. He pulls no punches and is upfront about what he believes, including using "replacement theology" language. I disagree with him concerning his replacement theology view and his denial of the significance of the nation Israel in God's purposes, but I appreciate his passionate defense of his view. His chapter also gives important insight concerning how covenantalists still view dispensationalists. If you get a chance to read Reymond's chapter let me know what you think. I hope to do another blog entry on this book soon. "The Biblical Method of Salvation: Continuity," in Continuity and Discontinuity , ed. John Feinberg. Crossway, 1988, 133. The Bible and the Future . Eerdmans, 1979, 194.